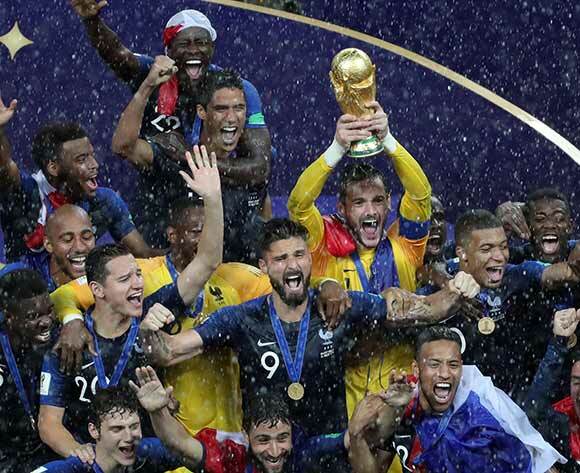 epa06891812 Corentin Tolisso (C), Presnel Kimpembe (R) and Thomas Lemar (L) of France celebrate after the FIFA World Cup 2018 final between France and Croatia in Moscow, Russia, 15 July 2018. 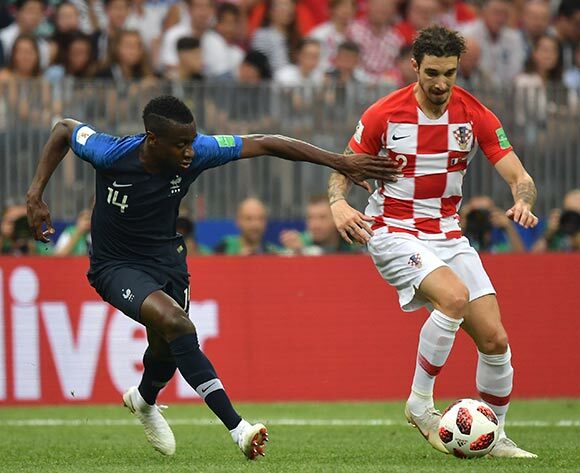 France won 4-2.
epa06891873 Players of France celebrate after winning the FIFA World Cup 2018 final between France and Croatia in Moscow, Russia, 15 July 2018.
epa06891235 Blaise Matuidi (L) of France and Sime Vrsaljko of Croatia in action during the FIFA World Cup 2018 final between France and Croatia in Moscow, Russia, 15 July 2018.
epa06891175 Sime Vrsaljko of Croatia (L) and Corentin Tolisso of France during the FIFA World Cup 2018 final between France and Croatia in Moscow, Russia, 15 July 2018.
epa06891360 Luka Modric (C) of Croatia vies for the ball with Ngolo Kante (L) and Blaise Matuidi of France during the FIFA World Cup 2018 final between France and Croatia in Moscow, Russia, 15 July 2018.
epa06891125 Domagoj Vida (L) of Croatia and Antoine Griezmann of France in action during the FIFA World Cup 2018 final between France and Croatia in Moscow, Russia, 15 July 2018.
epa06891130 Dejan Lovren (L) of Croatia and Olivier Giroud of France in action during the FIFA World Cup 2018 final between France and Croatia in Moscow, Russia, 15 July 2018.
epa06891169 Ivan Rakitic (R) of Croatia and Paul Pogba of France in action during the FIFA World Cup 2018 final between France and Croatia in Moscow, Russia, 15 July 2018.
epa06879043 Olivier Giroud (R) of France and Kevin De Bruyne of Belgium in action during the FIFA World Cup 2018 semi final soccer match between France and Belgium in St.Petersburg, Russia, 10 July 2018. 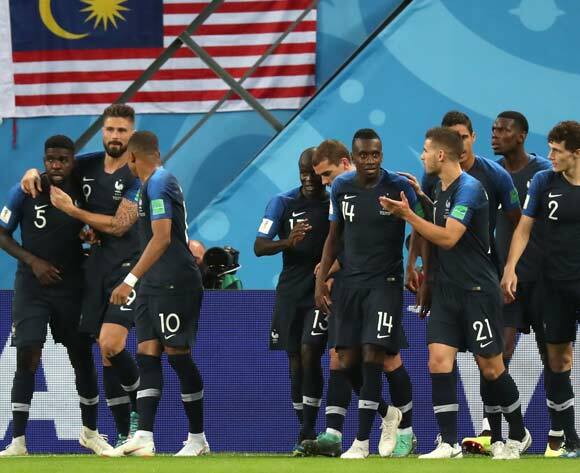 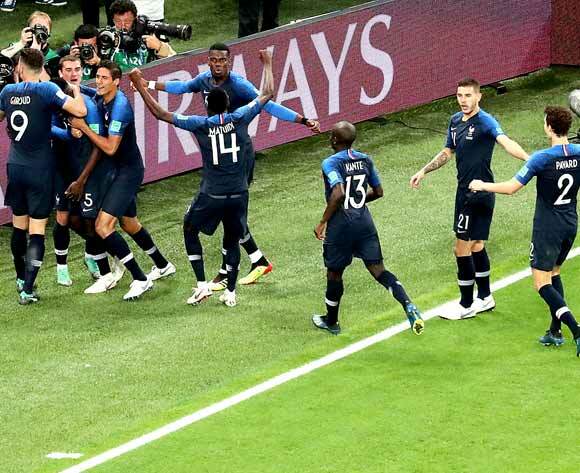 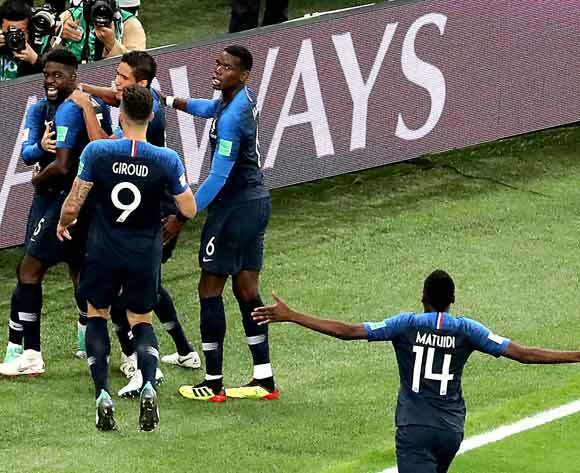 Samuel Umtiti (L)of France celebrates with teammates after scoring the opening goal during the FIFA World Cup 2018 semi final soccer match between France and Belgium in St.Petersburg, Russia, 10 July 2018.
epa06878931 Samuel Umtiti of France (2-L) celebrates with teammates scoring the 1-0 lead during the FIFA World Cup 2018 semi final soccer match between France and Belgium in St.Petersburg, Russia, 10 July 2018.
epa06878941 Samuel Umtiti of France (L) celebrates with teammates scoring the 1-0 lead during the FIFA World Cup 2018 semi final soccer match between France and Belgium in St.Petersburg, Russia, 10 July 2018.
epa06879021 Paul Pogba (L) of France and Eden Hazard of Belgium in action during the FIFA World Cup 2018 semi final soccer match between France and Belgium in St.Petersburg, Russia, 10 July 2018. 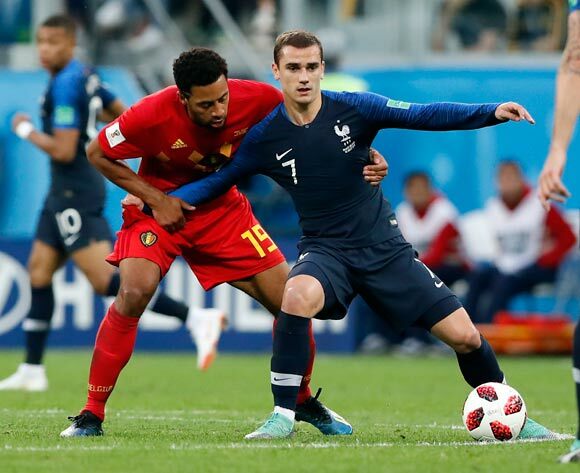 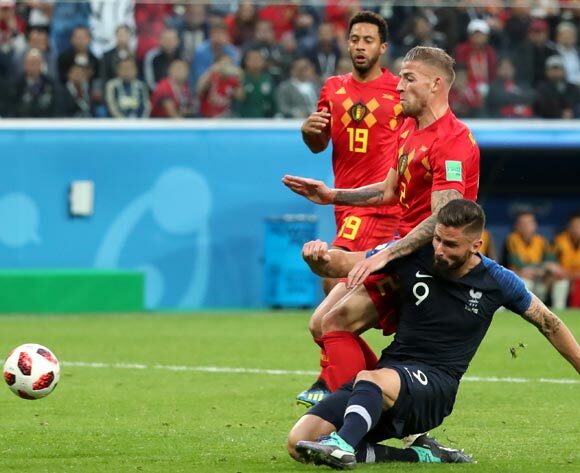 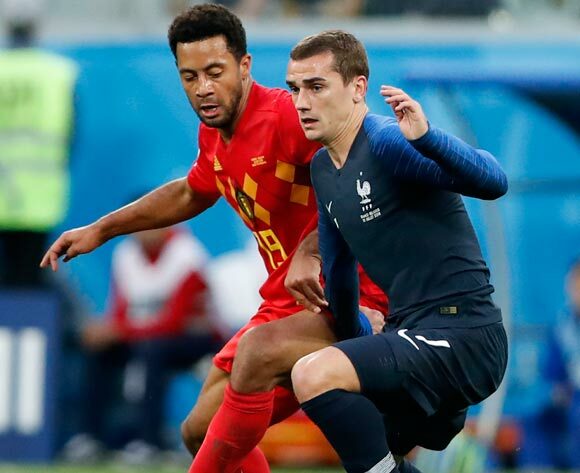 Antoine Griezmann of France (R) and Moussa Dembele of Belgium in action during the FIFA World Cup 2018 semi final soccer match between France and Belgium in St.Petersburg, Russia, 10 July 2018.
epa06878790 Moussa Dembele (L) of Belgium and Ngolo Kante of France in action during the FIFA World Cup 2018 semi final soccer match between France and Belgium in St.Petersburg, Russia, 10 July 2018.
epa06878780 Antoine Griezmann of France (R) and Toby Alderweireld of Belgium (C) in action during the FIFA World Cup 2018 semi final soccer match between France and Belgium in St.Petersburg, Russia, 10 July 2018.
epa06878749 Ngolo Kante of France (L) and Axel Witsel of Belgium in action during the FIFA World Cup 2018 semi final soccer match between France and Belgium in St.Petersburg, Russia, 10 July 2018.
epa06878767 Moussa Dembele (L) of Belgium in action against Benjamin Pavard (R) of France during the FIFA World Cup 2018 semi final soccer match between France and Belgium in St.Petersburg, Russia, 10 July 2018.
epa06878768 Olivier Giroud (down) of France in action during the FIFA World Cup 2018 semi final soccer match between France and Belgium in St.Petersburg, Russia, 10 July 2018.
epa06878771 Antoine Griezmann of France (R) and Moussa Dembele of Belgium in action during the FIFA World Cup 2018 semi final soccer match between France and Belgium in St.Petersburg, Russia, 10 July 2018. 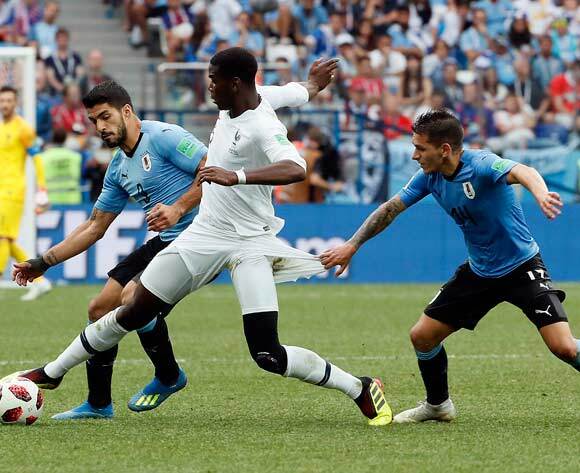 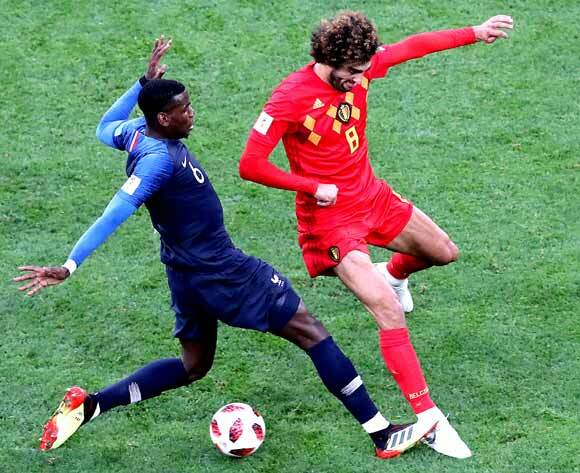 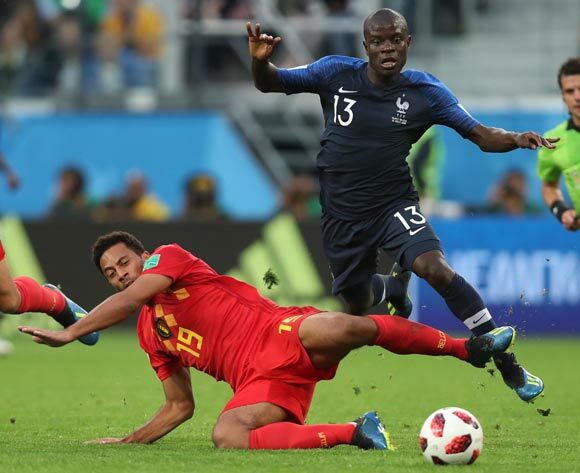 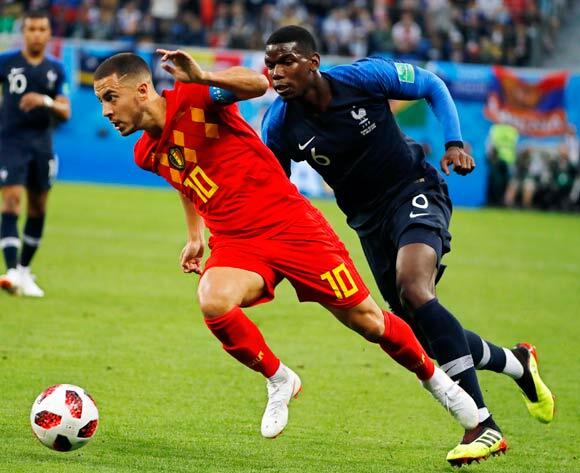 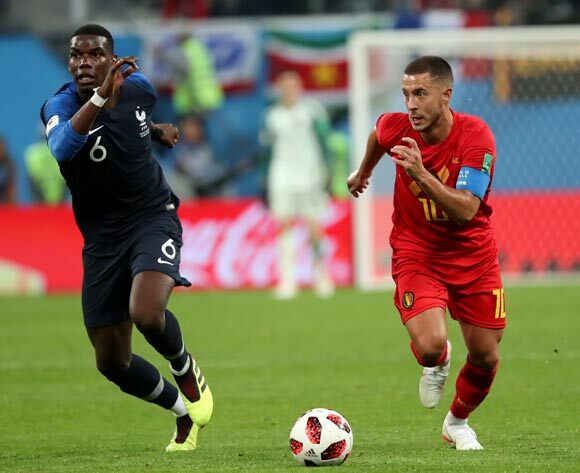 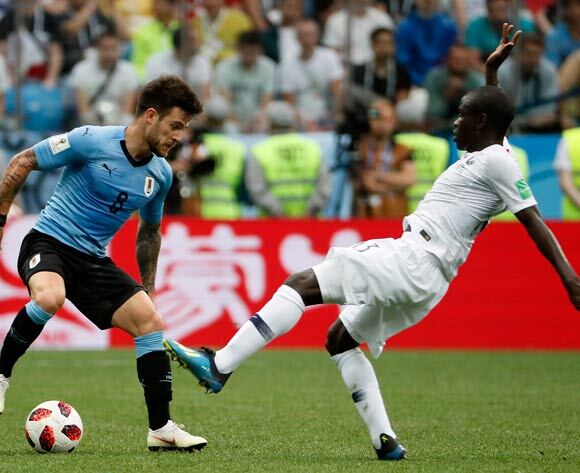 Eden Hazard (L) of Belgium in action against Paul Pogba (R) of France during the FIFA World Cup 2018 semi final soccer match between France and Belgium in St.Petersburg, Russia, 10 July 2018.
epa06878747 Marouane Fellaini of Belgium (R) and Paul Pogba of France in action during the FIFA World Cup 2018 semi final soccer match between France and Belgium in St.Petersburg, Russia, 10 July 2018.
epa06872776 Players of Russia react during the penalty shootout of the FIFA World Cup 2018 quarter final soccer match between Russia and Croatia in Sochi, Russia, 07 July 2018. 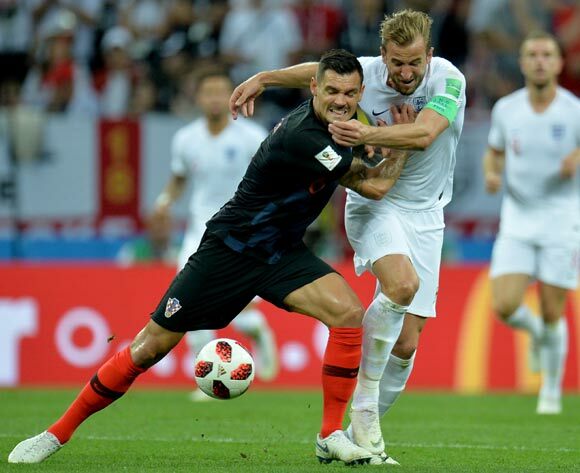 Croatia won 4-3 on penalties. 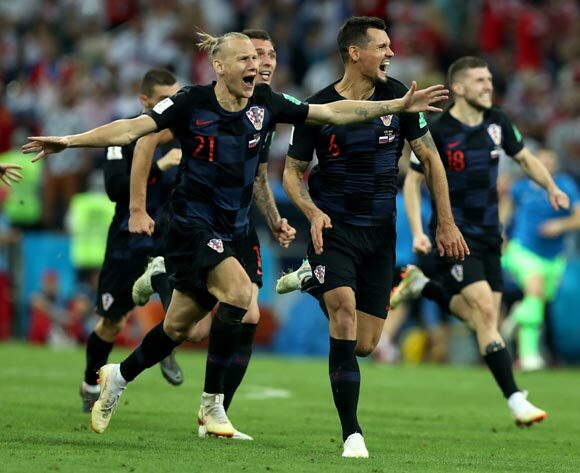 epa06872785 Players of Croatia celebrate winning the penalty shoutout of the FIFA World Cup 2018 quarter final soccer match between Russia and Croatia in Sochi, Russia, 07 July 2018.
epa06872747 Luka Modric (2-R) of Croatia in action against Yury Gazinsky (R) of Russia during the FIFA World Cup 2018 quarter final soccer match between Russia and Croatia in Sochi, Russia, 07 July 2018. 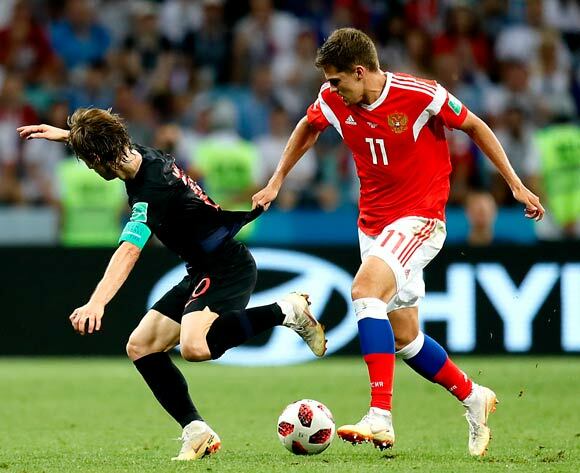 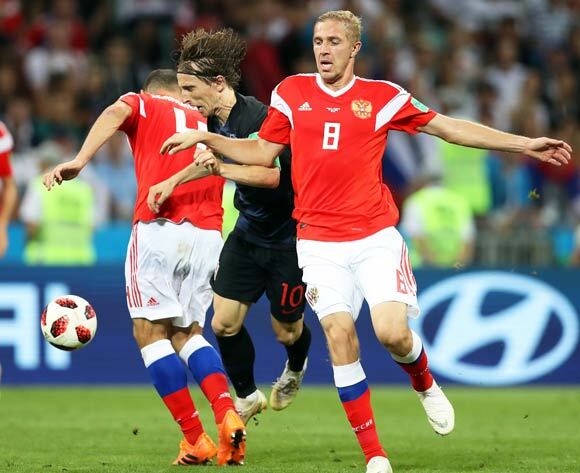 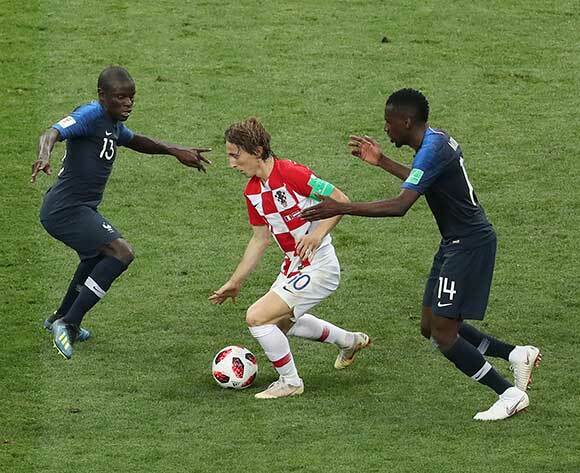 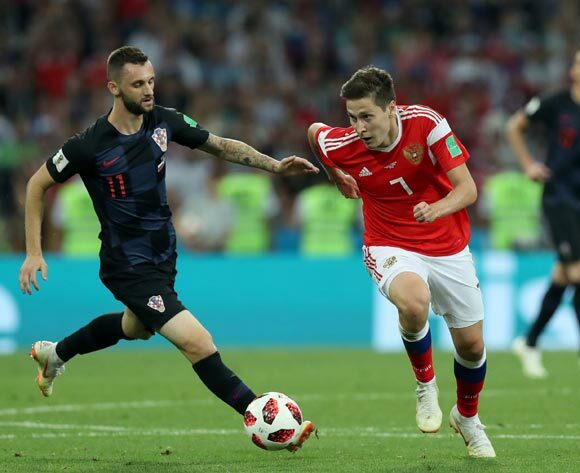 Luka Modric (R) of Croatia in action during the FIFA World Cup 2018 quarter final soccer match between Russia and Croatia in Sochi, Russia, 07 July 2018.
epa06872491 Roman Zobnin of Russia (R) and Luka Modric of Croatia in action during the FIFA World Cup 2018 quarter final soccer match between Russia and Croatia in Sochi, Russia, 07 July 2018.
epa06872550 Mario Mandzukic (L) of Croatia in action against Roman Zobnin (R) of Russia during the FIFA World Cup 2018 quarter final soccer match between Russia and Croatia in Sochi, Russia, 07 July 2018.
epa06872625 Dejan Lovren (L) of Croatia in action against Fedor Smolov (R) of Russia during the FIFA World Cup 2018 quarter final soccer match between Russia and Croatia in Sochi, Russia, 07 July 2018.
epa06872442 Mario Mandzukic (R) of Croatia and Roman Zobnin of Russia in action during the FIFA World Cup 2018 quarter final soccer match between Russia and Croatia in Sochi, Russia, 07 July 2018.
epa06872477 Daler Kuzyaev (R) of Russia and Marcelo Brozovic of Croatia in action during the FIFA World Cup 2018 quarter final soccer match between Russia and Croatia in Sochi, Russia, 07 July 2018.
epa06871088 Victor Lindelof (L) of Sweden and Raheem Sterling of England in action during the FIFA World Cup 2018 quarter final soccer match between Sweden and England in Samara, Russia, 07 July 2018.
epa06871113 Emil Forsberg of Sweden (back-L) and John Stones of England in action during the FIFA World Cup 2018 quarter final soccer match between Sweden and England in Samara, Russia, 07 July 2018.
epa06871123 Marcus Berg (C) of Sweden in action against England players Jesse Lingard (L) and Kyle Walker (R) during the FIFA World Cup 2018 quarter final soccer match between Sweden and England in Samara, Russia, 07 July 2018.
epa06871077 Raheem Sterling of England (R) and Sebastian Larsson of Sweden in action during the FIFA World Cup 2018 quarter final soccer match between Sweden and England in Samara, Russia, 07 July 2018.
epa06871080 Harry Kane (L) of England and Sebastian Larsson of Sweden in action during the FIFA World Cup 2018 quarter final soccer match between Sweden and England in Samara, Russia, 07 July 2018. 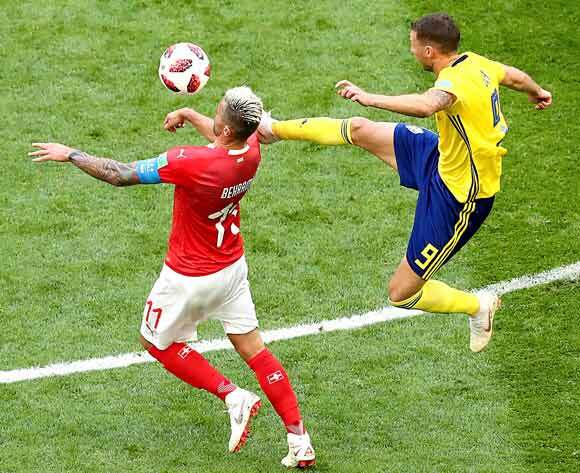 Dele Alli (L) of England and Emil Forsberg of Sweden in action during the FIFA World Cup 2018 quarter final soccer match between Sweden and England in Samara, Russia, 07 July 2018.
epa06869764 Neymar of Brazil (front) reacts after the FIFA World Cup 2018 quarter final soccer match between Brazil and Belgium in Kazan, Russia, 06 July 2018.
epa06869803 Neymar (R) and Renato Augusto of Brazil react after the FIFA World Cup 2018 quarter final soccer match between Brazil and Belgium in Kazan, Russia, 06 July 2018. 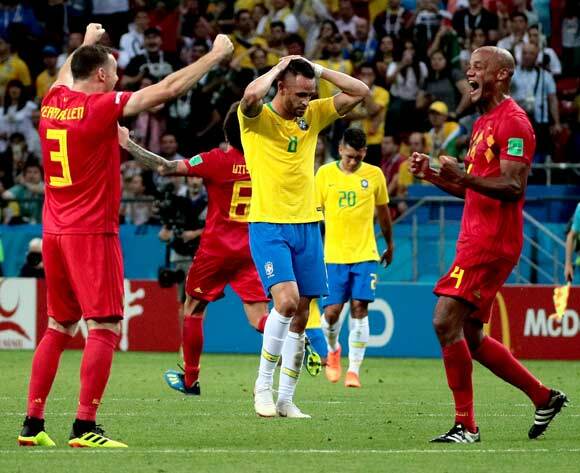 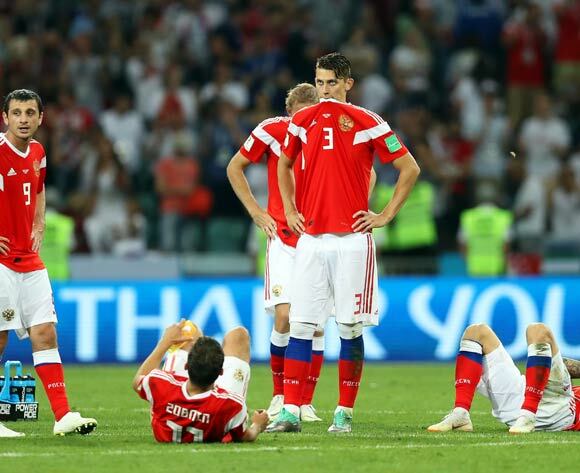 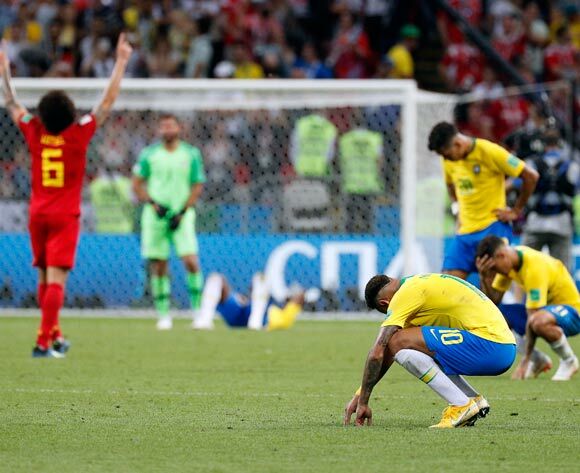 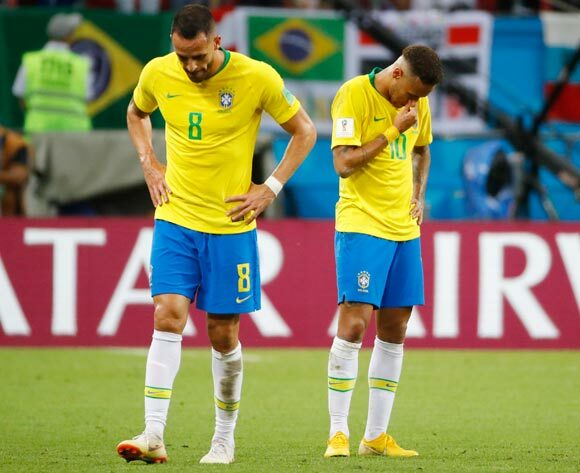 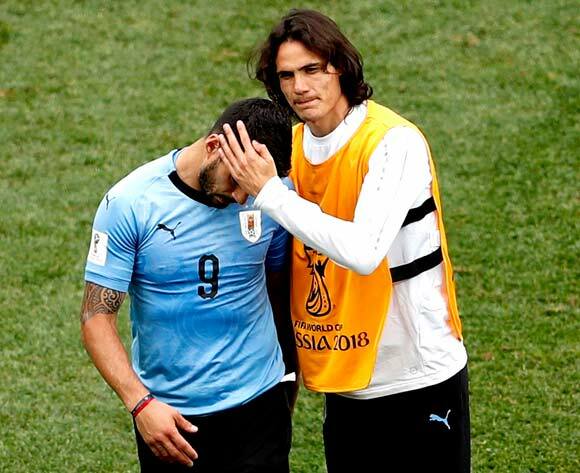 Brazil lost the match 1-2.
epa06869804 Thomas Vermaelen of Belgium (L) and Vincent Kompany of Belgium (R) celebrate next to Renato Augusto of Brazil (C) after the FIFA World Cup 2018 quarter final soccer match between Brazil and Belgium in Kazan, Russia, 06 July 2018. 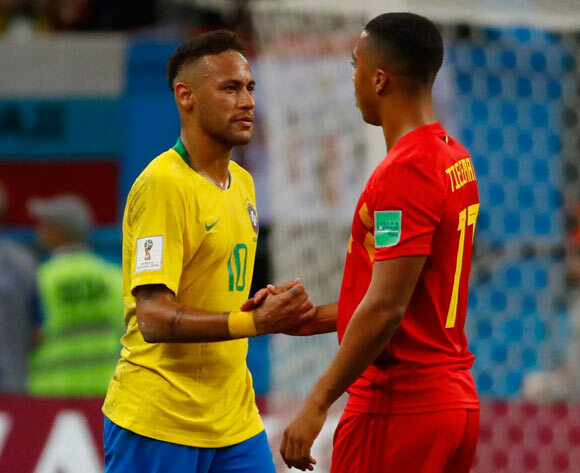 Neymar (L) of Brazil shakes hands with Youri Tielemans of Belgium after the FIFA World Cup 2018 quarter final soccer match between Brazil and Belgium in Kazan, Russia, 06 July 2018. 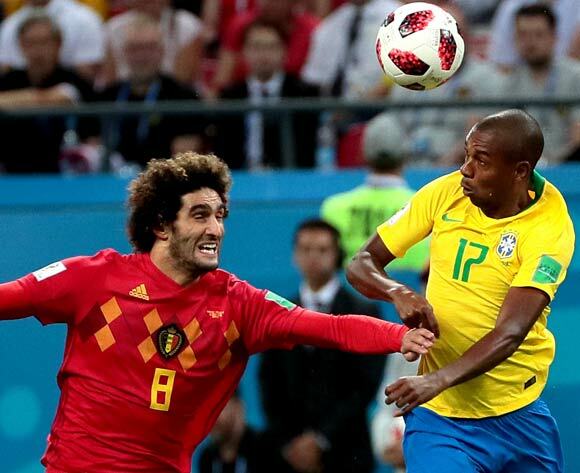 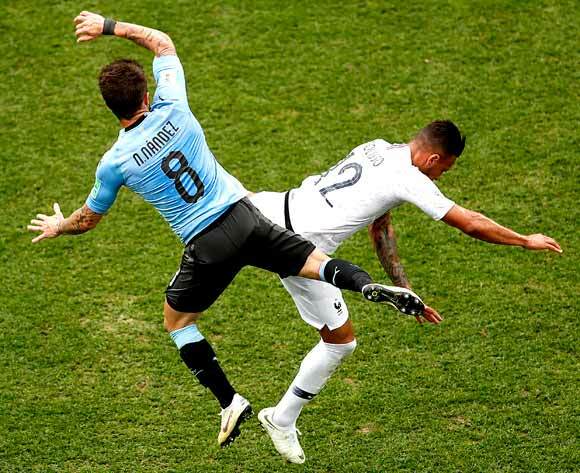 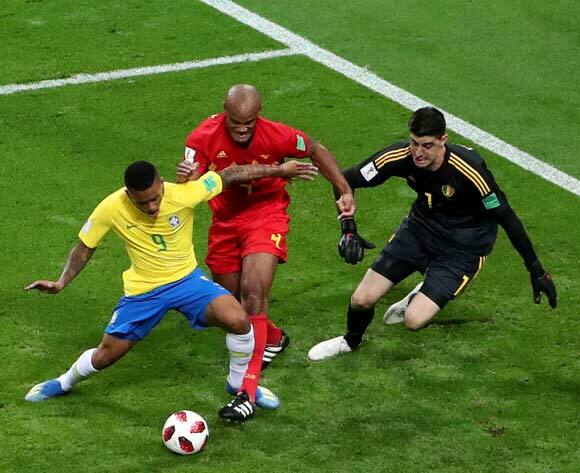 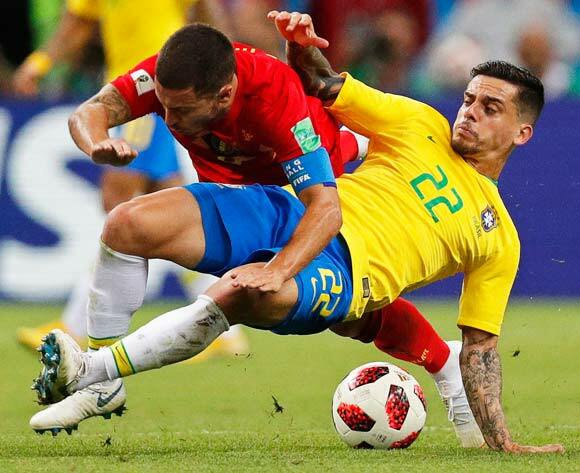 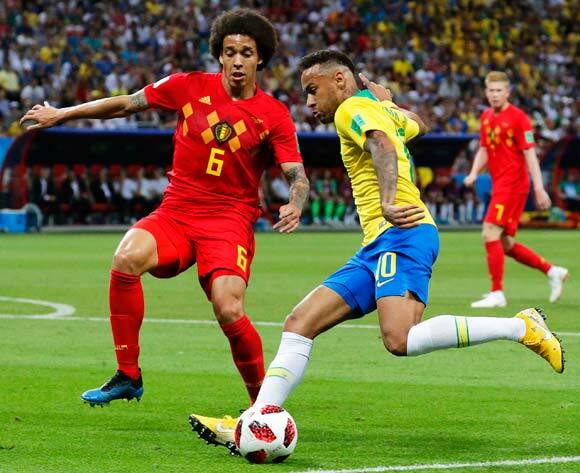 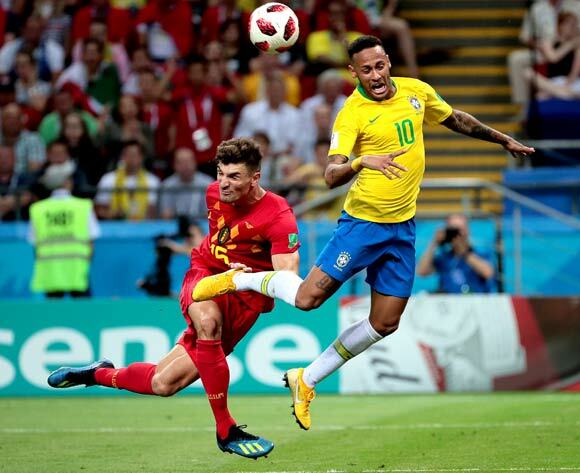 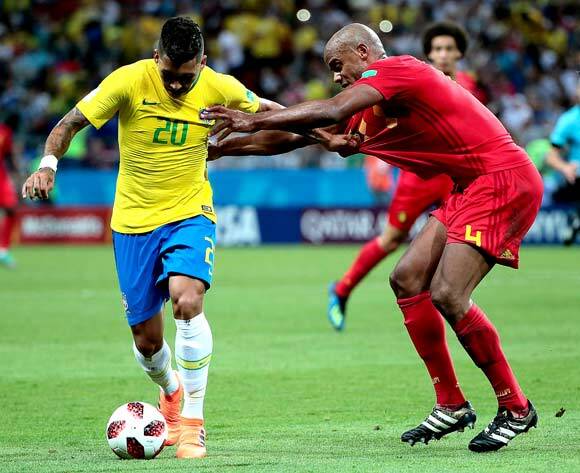 Brazil lost the match 1-2.
epa06869730 Fagner (R) of Brazil in action against Eden Hazard (L) of Belgium during the FIFA World Cup 2018 quarter final soccer match between Brazil and Belgium in Kazan, Russia, 06 July 2018.
epa06869693 Roberto Firmino of Brazil (L) and Vincent Kompany of Belgium in action during the FIFA World Cup 2018 quarter final soccer match between Brazil and Belgium in Kazan, Russia, 06 July 2018.
epa06869717 Miranda (up) of Brazil in action against Eden Hazard (bottom) of Belgium react during the FIFA World Cup 2018 quarter final soccer match between Brazil and Belgium in Kazan, Russia, 06 July 2018.
epa06869729 Neymar of Brazil (R) and Thomas Meunier of Belgium in action during the FIFA World Cup 2018 quarter final soccer match between Brazil and Belgium in Kazan, Russia, 06 July 2018.
epa06869228 Fernandinho of Brazil (R) and Marouane Fellaini of Belgium in action during the FIFA World Cup 2018 quarter final soccer match between Brazil and Belgium in Kazan, Russia, 06 July 2018. 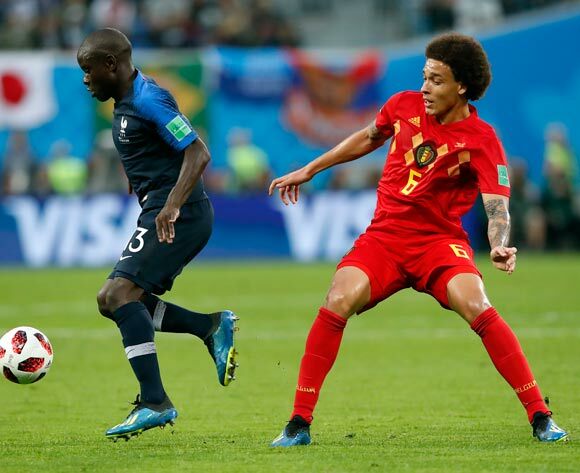 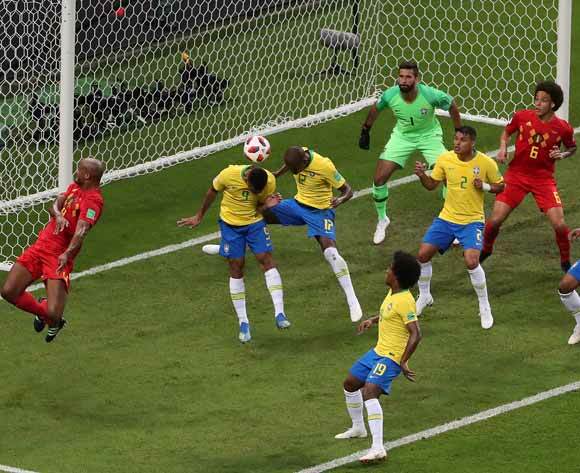 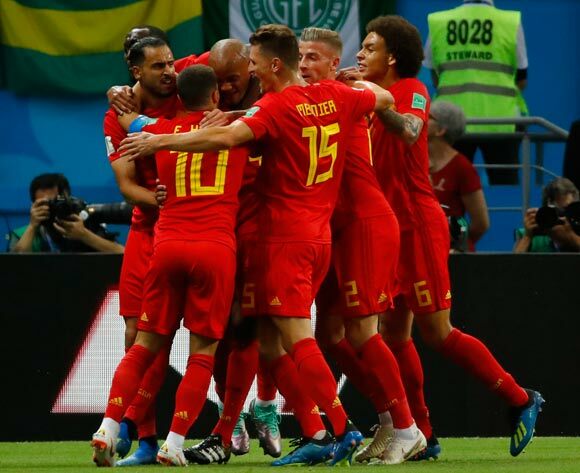 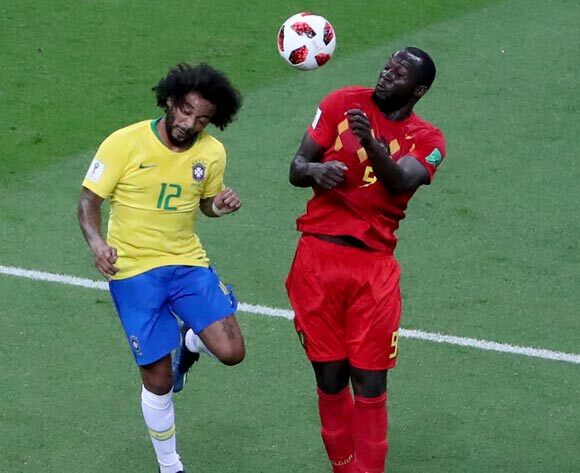 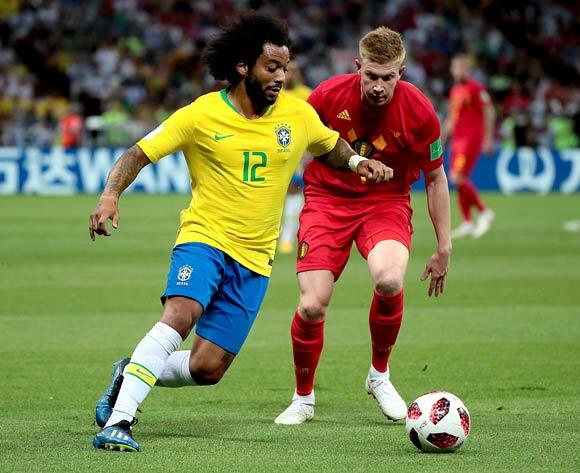 Players of Belgium celebrate the 1-0 lead during the FIFA World Cup 2018 quarter final soccer match between Brazil and Belgium in Kazan, Russia, 06 July 2018.
epa06869345 Marcelo (L) of Brazil and Romelu Lukaku of Belgium in action during the FIFA World Cup 2018 quarter final soccer match between Brazil and Belgium in Kazan, Russia, 06 July 2018.
epa06869336 Kevin De Bruyne of Belgium (R) and Marcelo of Brazil in action during the FIFA World Cup 2018 quarter final soccer match between Brazil and Belgium in Kazan, Russia, 06 July 2018.
epa06869318 Neymar (R) of Brazil in action during the FIFA World Cup 2018 quarter final soccer match between Brazil and Belgium in Kazan, Russia, 06 July 2018.
epa06869302 Axel Witsel (L) of Belgium in action against Neymar (R) of Brazil during the FIFA World Cup 2018 quarter final soccer match between Brazil and Belgium in Kazan, Russia, 06 July 2018.
epa06869268 Fernandinho of Brazil (3L) scores an own goal during the FIFA World Cup 2018 quarter final soccer match between Brazil and Belgium in Kazan, Russia, 06 July 2018.
epa06869314 Gabriel Jesus (L) of Brazil in action during the FIFA World Cup 2018 quarter final soccer match between Brazil and Belgium in Kazan, Russia, 06 July 2018.
epa06868894 France players react after the FIFA World Cup 2018 quarter final soccer match between Uruguay and France in Nizhny Novgorod, Russia, 06 July 2018.
epa06868875 Edinson Cavani of Uruguay (R) and Luis Suarez of Uruguay react after the FIFA World Cup 2018 quarter final soccer match between Uruguay and France in Nizhny Novgorod, Russia, 06 July 2018.
epa06868684 Cristian Rodriguez of Uruguay (R) and Paul Pogba of France in action during the FIFA World Cup 2018 quarter final soccer match between Uruguay and France in Nizhny Novgorod, Russia, 06 July 2018.
epa06868696 (L-R) Luis Suarez of Uruguay, Paul Pogba of France and Lucas Torreira of Uruguay in action during the FIFA World Cup 2018 quarter final soccer match between Uruguay and France in Nizhny Novgorod, Russia, 06 July 2018.
epa06868669 Olivier Giroud (R) of France and Jonathan Urretaviscaya of Uruguayy in action during the FIFA World Cup 2018 quarter final soccer match between Uruguay and France in Nizhny Novgorod, Russia, 06 July 2018.
epa06868658 Matias Vecino (L) of Uruguay in action against Raphael Varane (R) of France during the FIFA World Cup 2018 quarter final soccer match between Uruguay and France in Nizhny Novgorod, Russia, 06 July 2018.
epa06868423 Nahitan Nandez of Uruguay (L) and Corentin Tolisso of France in action during the FIFA World Cup 2018 quarter final soccer match between Uruguay and France in Nizhny Novgorod, Russia, 06 July 2018.
epa06868450 Olivier Giroud of France and Martin Caceres (L) of Uruguay in action during the FIFA World Cup 2018 quarter final soccer match between Uruguay and France in Nizhny Novgorod, Russia, 06 July 2018.
epa06868411 Lucas Hernandez (R) of France and Nahitan Nandez of Uruguay in action during the FIFA World Cup 2018 quarter final soccer match between Uruguay and France in Nizhny Novgorod, Russia, 06 July 2018.
epa06868421 Rodrigo Bentancur (R) of Uruguay fouls Corentin Tolisso of France during the FIFA World Cup 2018 quarter final soccer match between Uruguay and France in Nizhny Novgorod, Russia, 06 July 2018.
epa06868362 Cristhian Stuani (rear) of Uruguay and Paul Pogba of France in action during the FIFA World Cup 2018 quarter final soccer match between Uruguay and France in Nizhny Novgorod, Russia, 06 July 2018. 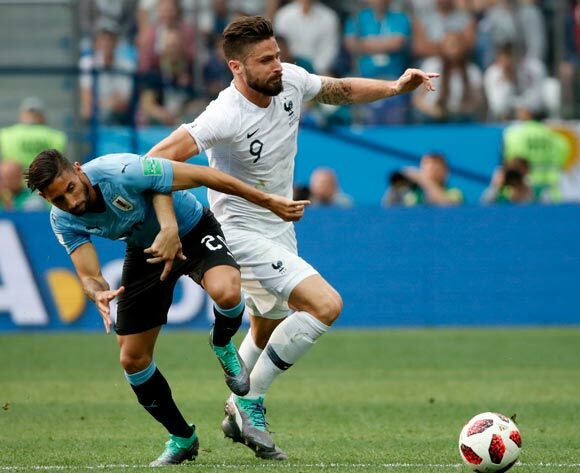 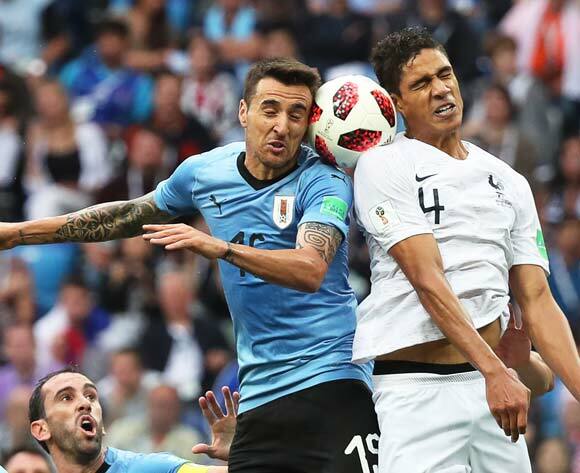 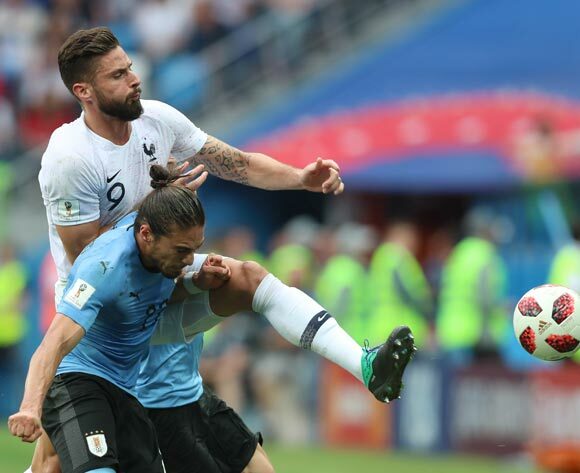 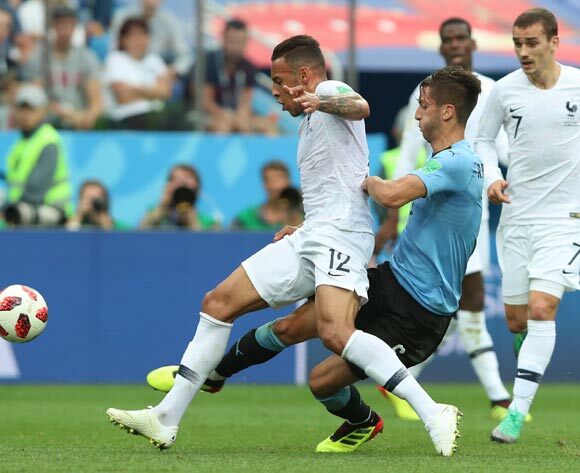 Kylian Mbappe (L) of France and Diego Laxalt of Uruguay in action during the FIFA World Cup 2018 quarter final soccer match between Uruguay and France in Nizhny Novgorod, Russia, 06 July 2018.
epa06868382 Ngolo Kante of France (R) and Nahitan Nandez of Uruguay in action during the FIFA World Cup 2018 quarter final soccer match between Uruguay and France in Nizhny Novgorod, Russia, 06 July 2018.
epa06868388 Benjamin Pavard (L) of France and Rodrigo Bentancur of Uruguay in action during the FIFA World Cup 2018 quarter final soccer match between Uruguay and France in Nizhny Novgorod, Russia, 06 July 2018.
epa06862355 John Stones (R) of England in action against Radamel Falcao (L) of Colombia during the FIFA World Cup 2018 round of 16 soccer match between Colombia and England in Moscow, Russia, 03 July 2018. 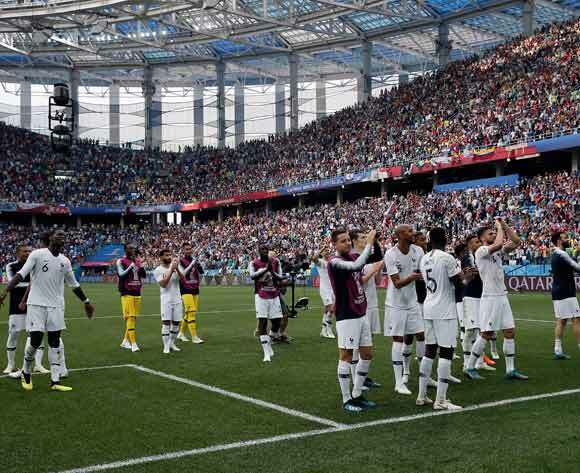 Players of England celebrate after the penalty shootout of the FIFA World Cup 2018 round of 16 soccer match between Colombia and England in Moscow, Russia, 03 July 2018. 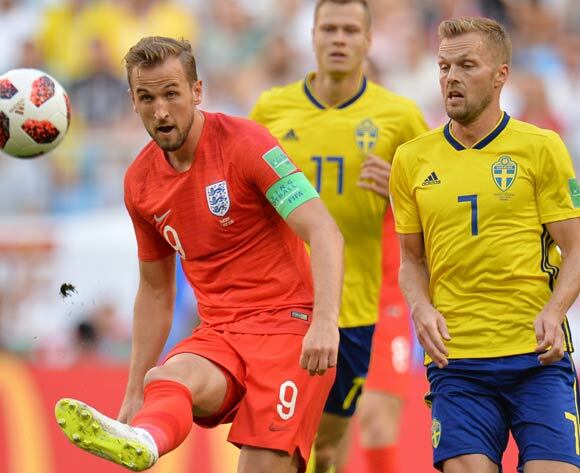 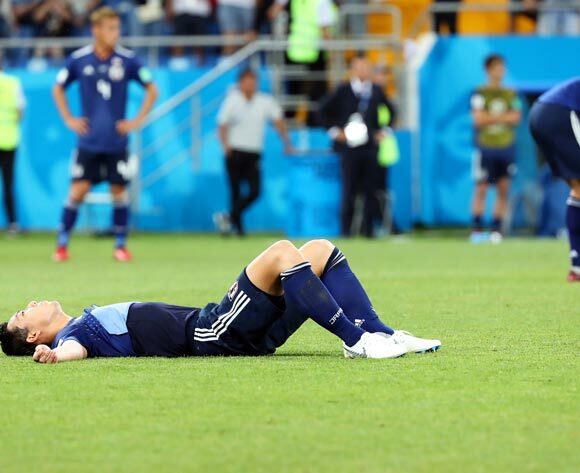 England won 4-3 on penalties. 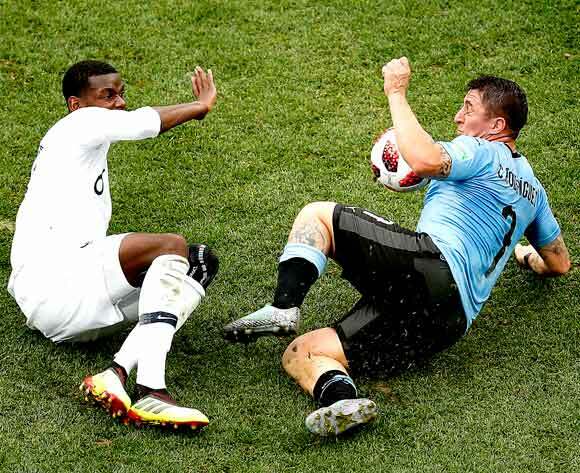 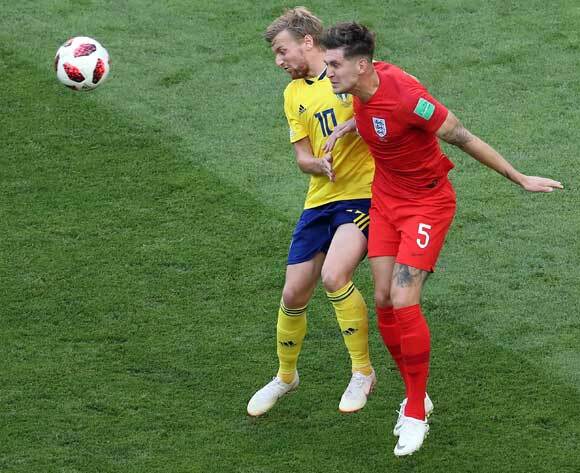 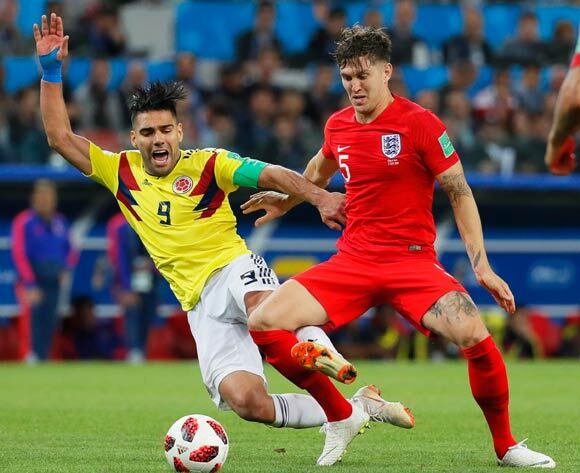 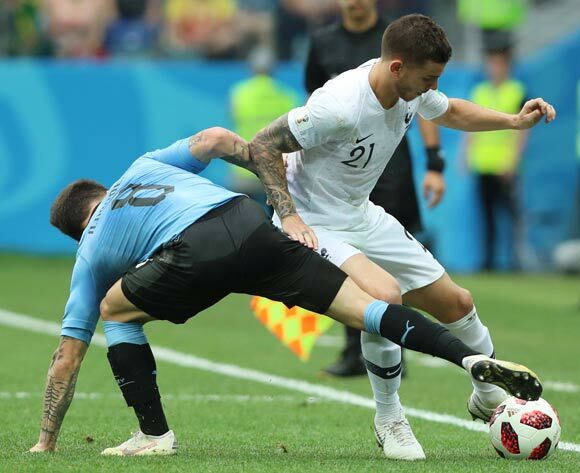 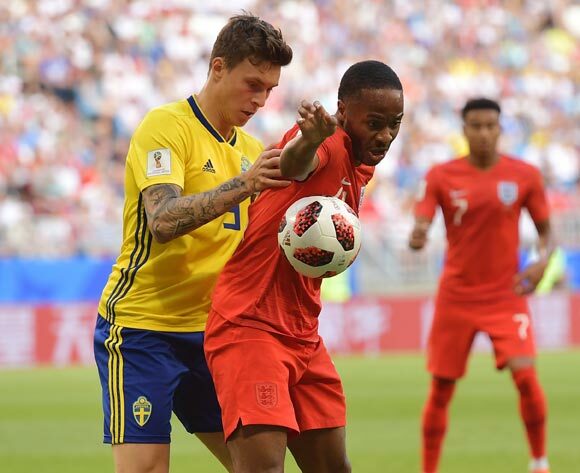 epa06861983 Radamel Falcao (L) of Colombia and John Stones of England in action during the FIFA World Cup 2018 round of 16 soccer match between Colombia and England in Moscow, Russia, 03 July 2018.
epa06861982 Johan Mojica (R) of Colombia in action against Dele Alli (L) of England during the FIFA World Cup 2018 round of 16 soccer match between Colombia and England in Moscow, Russia, 03 July 2018.
epa06861958 Raheem Sterling (R) of England in action against Yerry Mina (L) of Colombia during the FIFA World Cup 2018 round of 16 soccer match between Colombia and England in Moscow, Russia, 03 July 2018.
epa06861961 Harry Kane of England goes for a header during the FIFA World Cup 2018 round of 16 soccer match between Colombia and England in Moscow, Russia, 03 July 2018.
epa06861968 Yerry Mina of Colombia (L) and Harry Kane of England in action during the FIFA World Cup 2018 round of 16 soccer match between Colombia and England in Moscow, Russia, 03 July 2018. 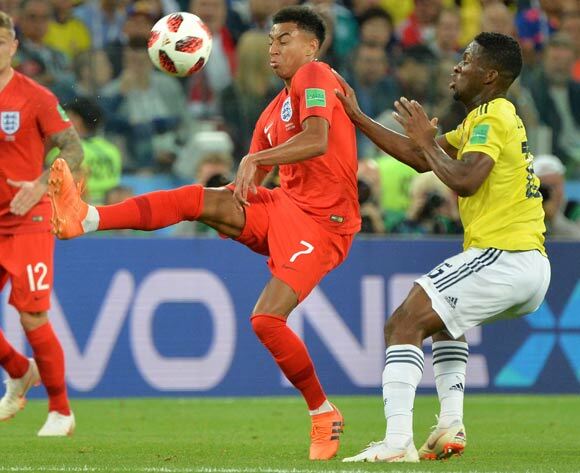 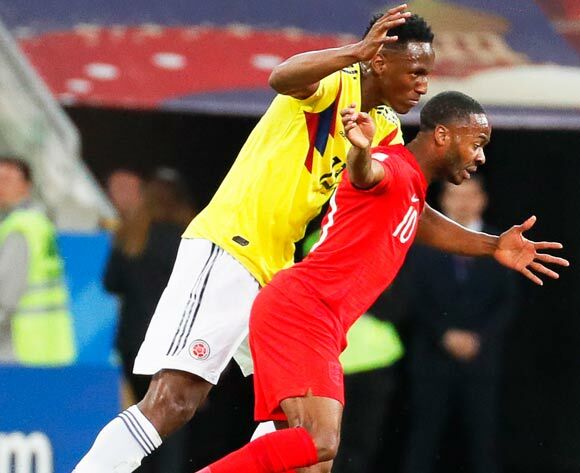 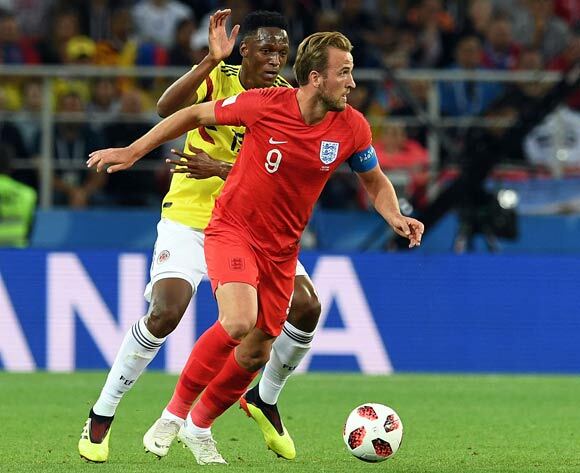 Johan Mojica (R) of Colombia in action against Kieran Trippier (L) of England during the FIFA World Cup 2018 round of 16 soccer match between Colombia and England in Moscow, Russia, 03 July 2018.
epa06861975 Johan Mojica (up) of Colombia in action against Kieran Trippier (back) of England during the FIFA World Cup 2018 round of 16 soccer match between Colombia and England in Moscow, Russia, 03 July 2018.
epa06861980 Jesse Lingard (C) of England in action during the FIFA World Cup 2018 round of 16 soccer match between Colombia and England in Moscow, Russia, 03 July 2018.
epa06861443 Players of Switzerland react after the FIFA World Cup 2018 round of 16 soccer match between Sweden and Switzerland in St.Petersburg, Russia, 03 July 2018.
epa06861465 Emil Forsberg of Sweden (C) celebrates with teammates scoring the winning goal during the FIFA World Cup 2018 round of 16 soccer match between Sweden and Switzerland in St.Petersburg, Russia, 03 July 2018. 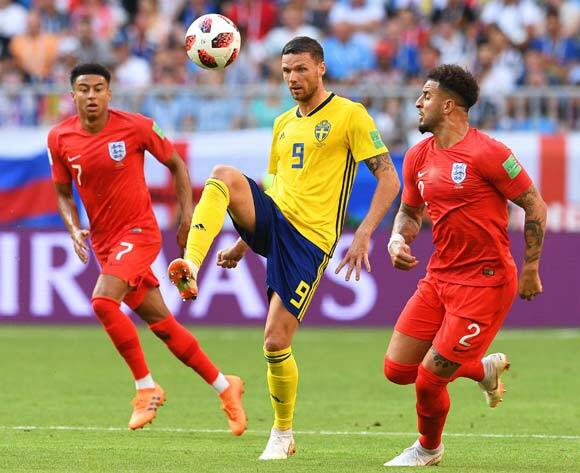 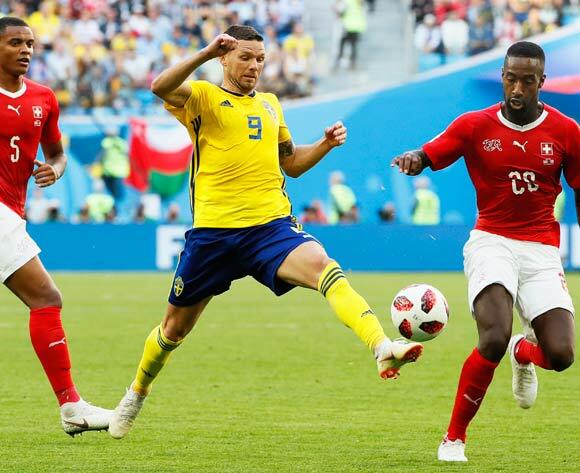 Marcus Berg (C) of Sweden in action against Swiss players Manuel Akanji (L) and Johan Djourou (R) during the FIFA World Cup 2018 round of 16 soccer match between Sweden and Switzerland in St.Petersburg, Russia, 03 July 2018.
epa06861071 Xherdan Shaqiri of Switzerland (R) and Ludwig Augustinsson of Sweden in action during the FIFA World Cup 2018 round of 16 soccer match between Sweden and Switzerland in St.Petersburg, Russia, 03 July 2018.
epa06861075 Marcus Berg (L) of Sweden in action against Johan Djourou (R) of Switzerland during the FIFA World Cup 2018 round of 16 soccer match between Sweden and Switzerland in St.Petersburg, Russia, 03 July 2018. 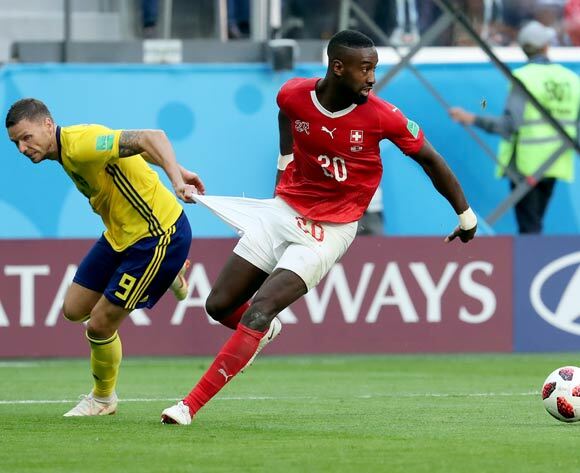 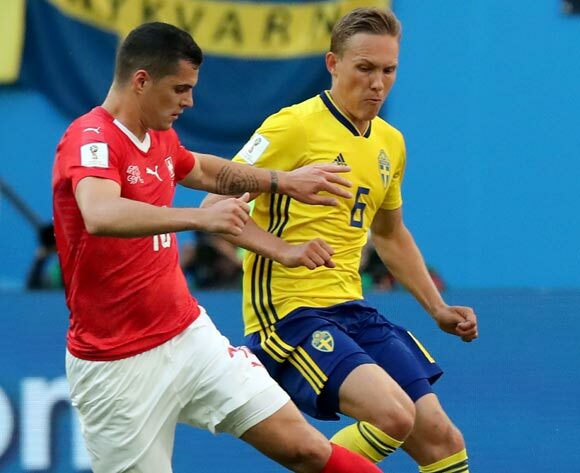 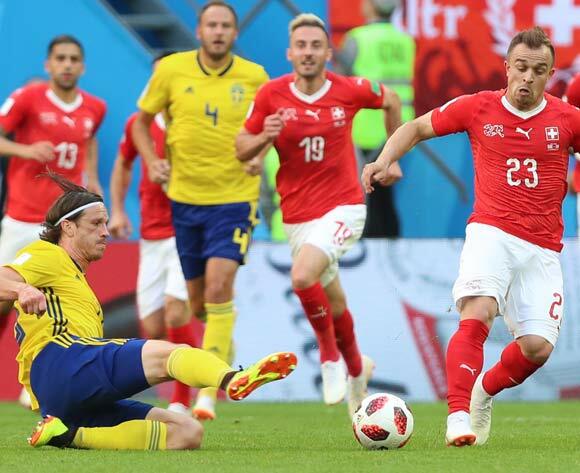 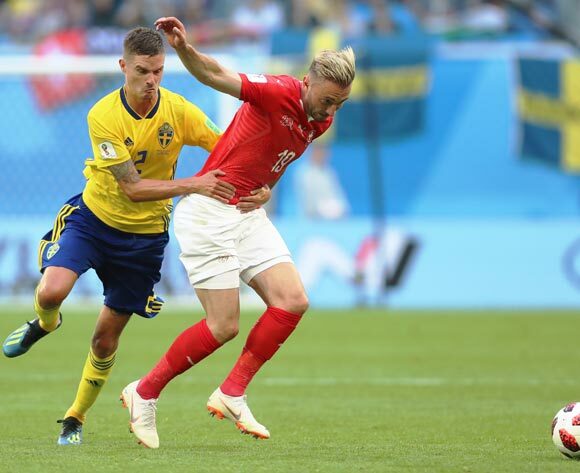 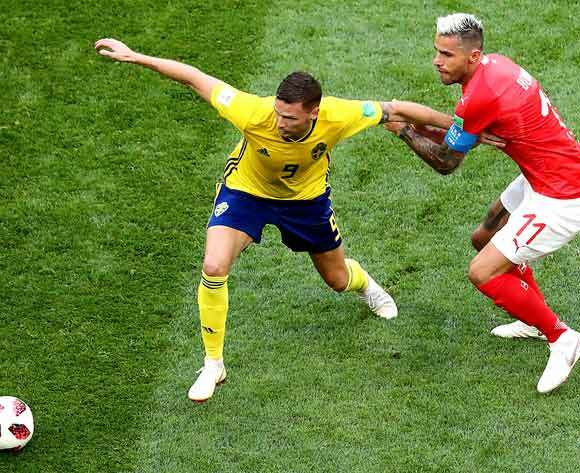 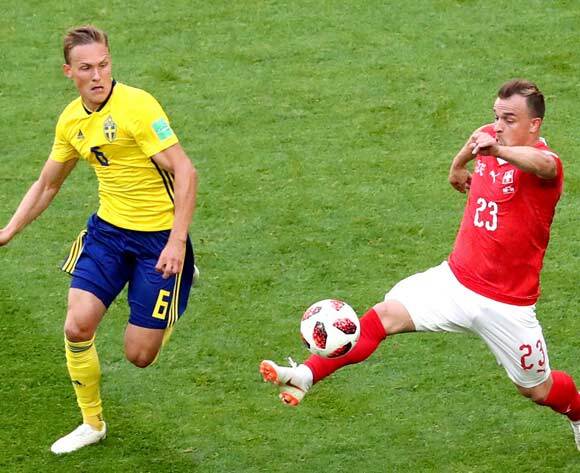 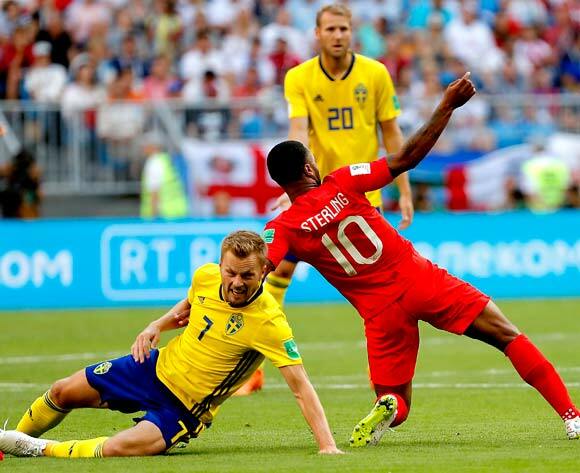 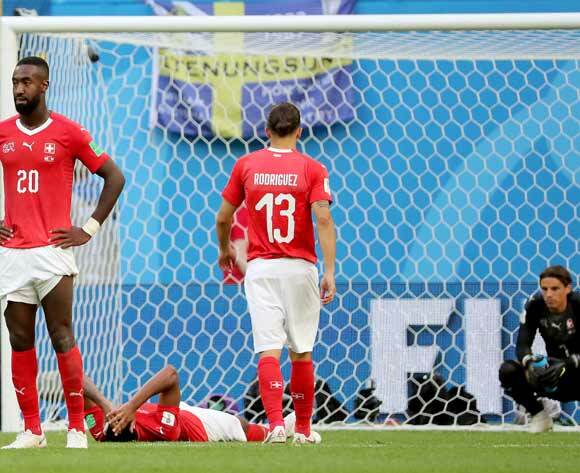 Gustav Svensson (L) of Sweden and Xherdan Shaqiri of Switzerland in action during the FIFA World Cup 2018 round of 16 soccer match between Sweden and Switzerland in St.Petersburg, Russia, 03 July 2018.
epa06861069 Marcus Berg of Sweden (L) and Johan Djourou of Switzerland in action during the FIFA World Cup 2018 round of 16 soccer match between Sweden and Switzerland in St.Petersburg, Russia, 03 July 2018.
epa06861048 Ludwig Augustinsson of Sweden (R) and Granit Xhaka of Switzerland in action during the FIFA World Cup 2018 round of 16 soccer match between Sweden and Switzerland in St.Petersburg, Russia, 03 July 2018.
epa06861049 Marcus Berg of Sweden (R) and Valon Behrami of Switzerland in action during the FIFA World Cup 2018 round of 16 soccer match between Sweden and Switzerland in St.Petersburg, Russia, 03 July 2018.
epa06861052 Mikael Lustig (L) of Sweden fouls Josip Drmic of Switzerland during the FIFA World Cup 2018 round of 16 soccer match between Sweden and Switzerland in St.Petersburg, Russia, 03 July 2018.
epa06861062 Marcus Berg of Sweden (L) and Valon Behrami of Switzerland in action during the FIFA World Cup 2018 round of 16 soccer match between Sweden and Switzerland in St.Petersburg, Russia, 03 July 2018.
epa06859462 Players of Japan react after the FIFA World Cup 2018 round of 16 soccer match between Belgium and Japan in Rostov-On-Don, Russia, 02 July 2018. 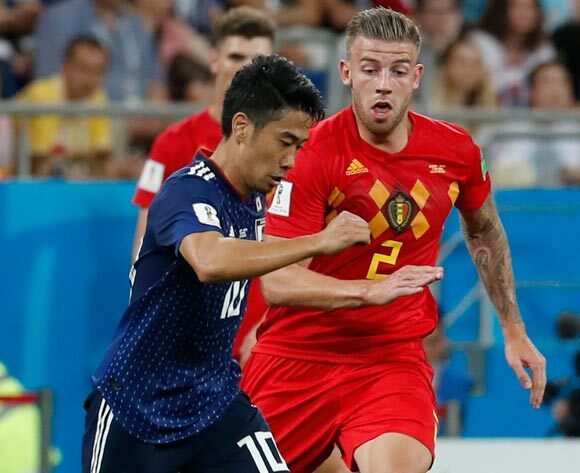 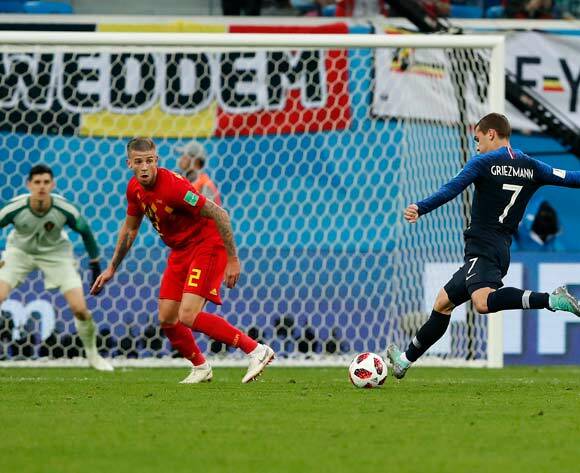 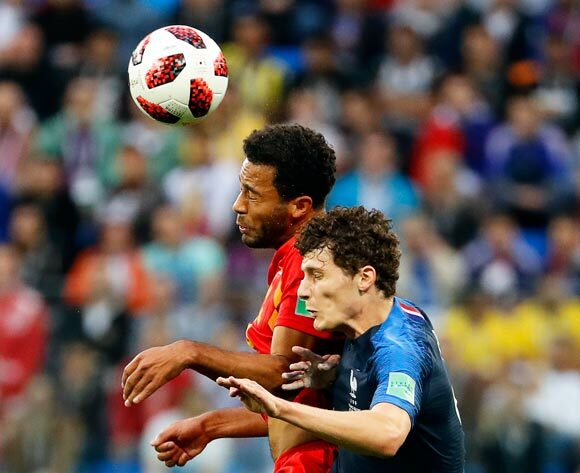 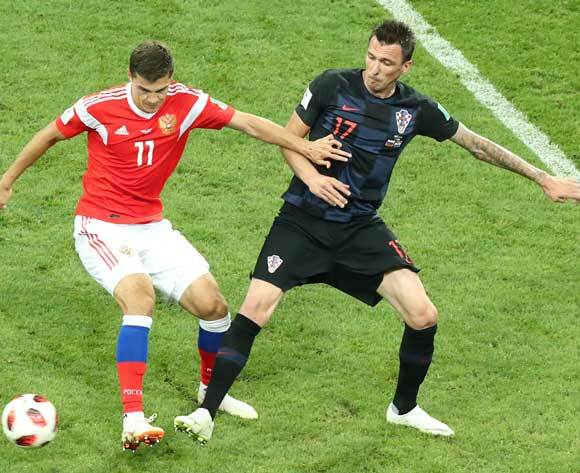 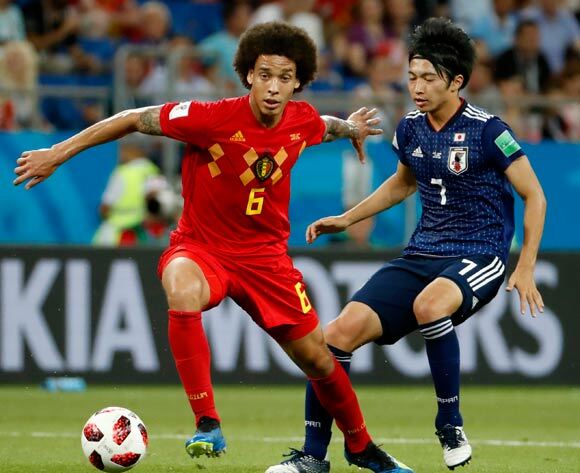 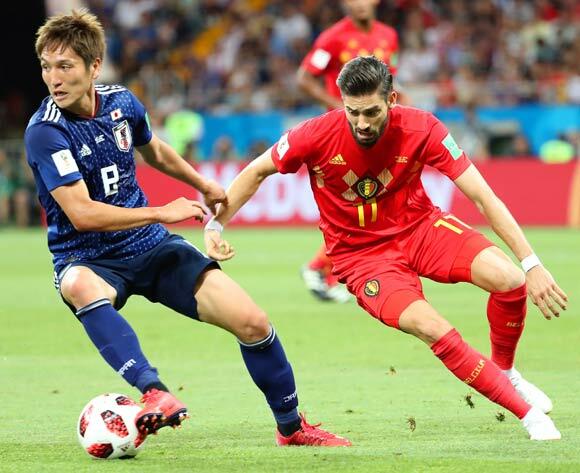 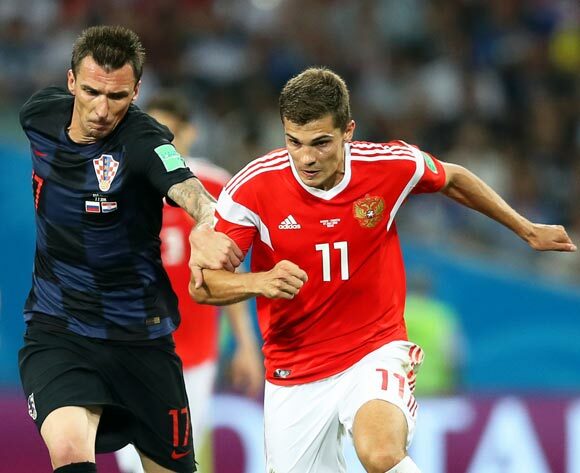 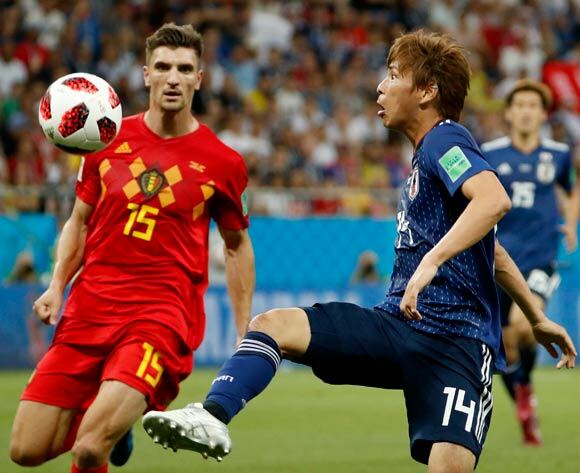 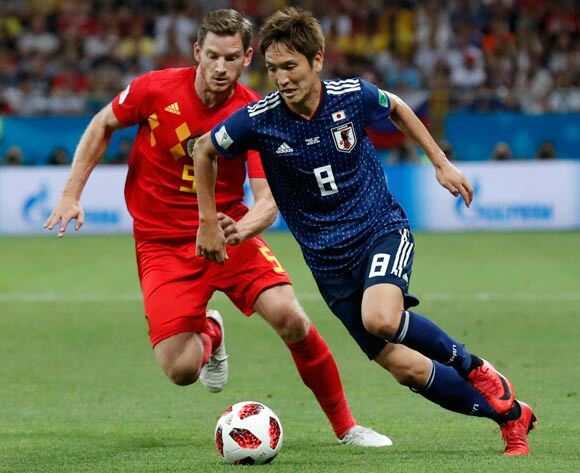 Belgium won 3-2.
epa06859099 Thomas Meunier (L) of Belgium and Takashi Inui of Japan in action during the FIFA World Cup 2018 round of 16 soccer match between Belgium and Japan in Rostov-On-Don, Russia, 02 July 2018.
epa06859096 Axel Witsel of Belgium (L) and Shinji Kagawa of Japan in action during the FIFA World Cup 2018 round of 16 soccer match between Belgium and Japan in Rostov-On-Don, Russia, 02 July 2018.
epa06859098 Shinji Kagawa (L) of Japan and Toby Alderweireld of Belgium in action during the FIFA World Cup 2018 round of 16 soccer match between Belgium and Japan in Rostov-On-Don, Russia, 02 July 2018. 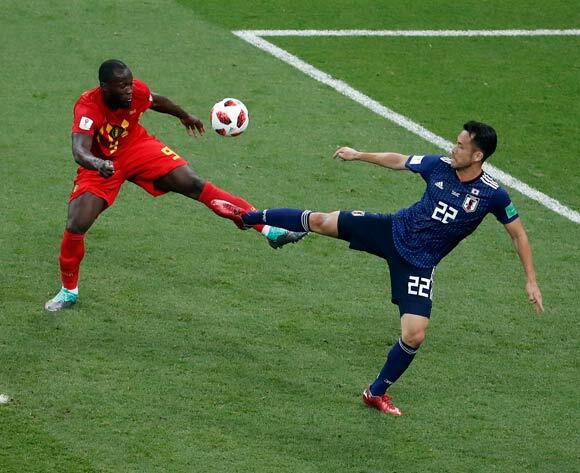 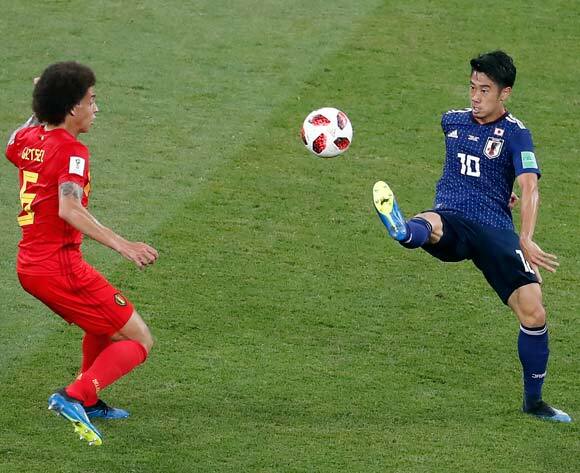 Romelu Lukaku of Belgium of Belgium (L) and Gen Shoji of Japan in action the FIFA World Cup 2018 round of 16 soccer match between Belgium and Japan in Rostov-On-Don, Russia, 02 July 2018.
epa06859041 Genki Haraguchi (R) of Japan and Jan Vertonghen of Belgium in action during the FIFA World Cup 2018 round of 16 soccer match between Belgium and Japan in Rostov-On-Don, Russia, 02 July 2018.
epa06859065 Axel Witsel (L) of Belgium and Gaku Shibasaki of Japan in action during the FIFA World Cup 2018 round of 16 soccer match between Belgium and Japan in Rostov-On-Don, Russia, 02 July 2018. 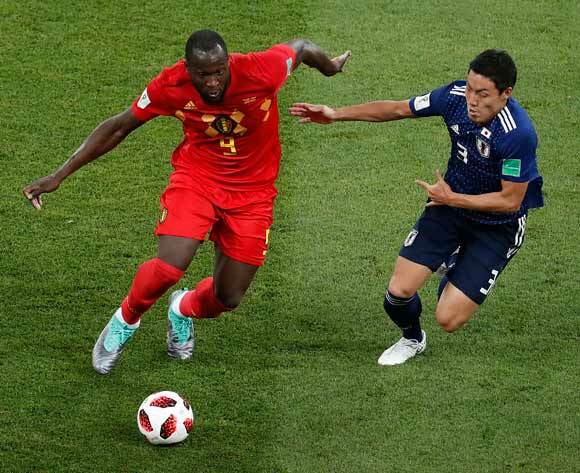 Romelu Lukaku of Belgium (L) and Maya Yoshida of Japan in action during the FIFA World Cup 2018 round of 16 soccer match between Belgium and Japan in Rostov-On-Don, Russia, 02 July 2018.
epa06859076 Genki Haraguchi (L) of Japan in action against Yannick Carrasco (R) of Belgium during the FIFA World Cup 2018 round of 16 soccer match between Belgium and Japan in Rostov-On-Don, Russia, 02 July 2018. 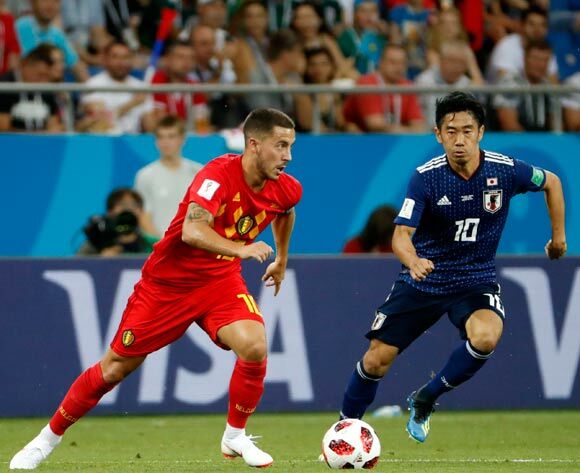 Eden Hazard (L) of Belgium and Shinji Kagawa of Japan in action during the FIFA World Cup 2018 round of 16 soccer match between Belgium and Japan in Rostov-On-Don, Russia, 02 July 2018.
epa06858541 Neymar of Brazil celebrates after the FIFA World Cup 2018 round of 16 soccer match between Brazil and Mexico in Samara, Russia, 02 July 2018.